Humboldt Park residents will soon welcome a new addition on Division Street also known as Paseo Boricua. On Monday morning, the Puerto Rican Cultural Center (PRCC) Board of Directors held a press conference with the help of Alderman Roberto Maldonado, PRCC Executive Director José E. López, and Richard Sciortino, principal of Brinshore Development, LLC, and Urban Works Architects, and unveiled the Paseo Boricua Arts Building, a new development that will appear on the 2700 Block of West Division Street. Joined by more than 100 local community residents and civic leaders, the much anticipated project aims to transform seven buildings, including the former site of Ashland Sausage Company, vacant since 2005, into a cultural Mecca that promotes local artists in various media. The center will encompass 15 live/work residences for artists and their families; a 99 seat multi-media theater with film, theatre, and concert performances; and a nearly 3,000 square foot art gallery with a retail component. According to López, a piano lounge showcasing wines from Latin America and spirits from the Caribbean will add to the nightlife. “It is our hope the Paseo Boricua Arts Building will strengthen the business sector of the 26th ward and generate economic stability and pride,” said Maldonado. 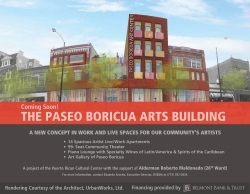 The Paseo Boricua Arts Building is set to open in 2016.